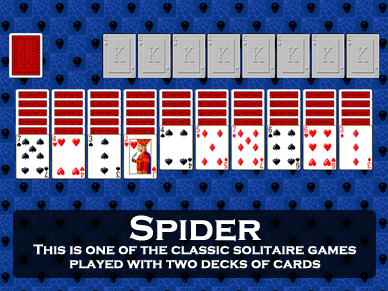 Spider is an increasingly popular 2 deck solitaire game. Spider was Franklin D. Roosevelt's favorite solitaire game. The rules to Spider are fairly simple, but winning the game can be difficult. Some hints are available here. Download Spider Now and over 950 other solitaire games for Windows 10! Play Spider and 11 other games for free in Goodsol Free Solitaire, a freeware download for Windows. You can play game numbers from 1 to 11982. Play Spider for free online.